The Presona balers are designed and built at our modern manufacturing facility in Sweden where focus is on efficiency, quality, safety and sustainability. Our balers are reliable, consistent and efficient. They are also designed to cope with rugged manufacturing, recycling and waste management environments. With a baler from Presona you will benefit from high material throughput and material flexibility capabilities; little or no downtime, extensive engineering and maintenance support. Just as important is the longevity. We have balers working worldwide that have been doing so for 10, 20 and 30+ years. These are not machines that will need replacing any time soon. The success of our balers comes down to experience. We have been designing, supplying and maintaining balers for more than 70 years. In addition, we also supply pneumatic waste extraction systems for the graphics, paper and packaging industries and conveyor systems and sorting plants for municipal waste facilities. Presona AB is one of the world’s leading designers and manufacturers of balers with pre-pressing technology for efficient baling of the most varieties of material – from paper and plastic to household and industrial waste. The product range also includes pneumatic waste extraction systems for the graphics industry, paper and packaging manufacturers and sorting plants for household waste. The company is based in Tomelilla in southern Sweden close to the continent. The head office and factory are housed in modern airy buildings in which the working environment has been prioritized. We have an efficient production flow and cooperate with established suppliers in order to ensure quality at every stage. Presona’s safety and environmental awareness permeates into our work – our employees’ working environment must be safe. It is paramount to us that the equipment we supply always offers the customer the greatest possible security. Presona´s equipment can be found (almost) everywhere. 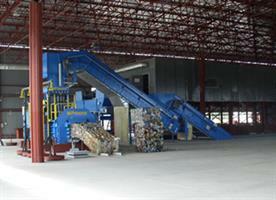 We have supplied baling systems, waste extraction and sorting plants to more than 65 countries all over the world. There are balers. And then there are exceptional balers. Presona balers are at the top end of the exceptional category. 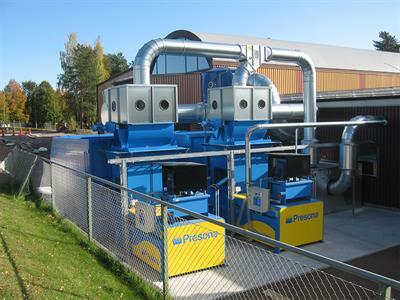 Designed and built at our modern manufacturing facility in Sweden where the focus is on efficiency, quality, safety and sustainability, Presona balers are the personification of Swedish precision engineering. They are reliable, consistent and efficient. They are also designed to cope with rugged manufacturing, recycling and waste management environments. Those that choose a Presona are making an investment in the success of their current and future operations. In doing so they benefit from high material throughput and material flexibility capabilities; little or no downtime and extensive engineering and maintenance support; and minimal requirement for operator intervention. Just as important, though, is the knowledge that Presona balers regularly out perform their peers in terms of longevity. 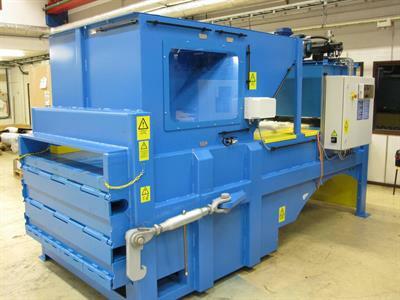 In fact, we have balers working worldwide that have been doing so for 10, 20 and 30+ years. These are not machines that will need replacing any time soon. The success of our balers comes down to experience. We have been designing, supplying and maintaining balers for more than 70 years. 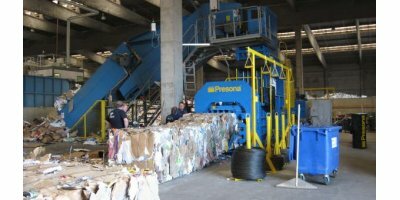 If you look, you can find Presona balers working with typical Swedish precision in paper mills, recycling facilities and logistics operations worldwide. In addition, we also supply pneumatic waste extraction systems for the graphics, paper and packaging industries and conveyor systems and sorting plants for municipal waste facilities. Presona is best known for its LP Series prepress balers. Versatile and with a range of custom-design features, LP Series balers are used by many blue chip organisations including Veolia, DS Smith, Smurfit Kappa, Asda, Tesco, COOP and XPO Logistics. Our innovative prepress technology creates consistent, high density bales which cuts transport costs. In addition, the prepress uses significantly less power than conventional balers, improving operational efficiency and reducing environmental impact. We’re happy to report that our clients have told us that the Presona prepress creates ‘the best-looking bales with perfect stackability’. We’ll take that. Fully automatic LP Series adaptive balers can be used to compact many different materials including: OCC, RDF, PET, newspapers, magazines, cardboard, print waste, municipal and solid waste. Models are available to suit low volume processors needing mill size bales up to integrated, high tonnage systems. Unlike shear balers, the prepress system does not need to cut off excess material. Instead it relies on an initial pre-compression step to achieve the best bales. This step delivers the improved bale consistency. It also gives a higher volume capacity per cycle. Added benefits include improved reliability, less wear and tear, reduced maintenance costs and minimised wire waste. Energy efficiency is another important advantage. The prepress technology means that all of the baler’s power is used for compaction, making LP Series balers up to 60% more energy efficient than comparable shear balers. To be the world´s leading supplier of compaction equipment for recyclables in order to help our customers reduce, reuse, recycle and recover with focus on efficiency and to the best possible benefit of the professional operator. To supply the smartest compaction technology. We provide full after-sales support for our products in the form of service and spare parts, to give our customer the possibility to handle waste in a cost efficient, safe and environmentally correct way. Manufacturing to specification regarding function, quality and environmental considerations. Delivering equipment at the agreed time. Providing repair-, maintenance- and spare parts service to reduce customer´s downtime to a minimum. Providing equipment that enables rational and effective waste handling and increases material recovery. Providing quality and accessibility to satisfy our customers to make sure they will stay with us and recommend us. Designing equipment that fulfils the requirements for performance, reliability and safe use. Having a responsive and learning organisation continually striving to improve products and services. Constantly increasing efficiency in the usage of raw material, resources and energy. Observing existing laws and regulations. Actively practise a systematic working environmental work to obtain a physically, mentally and socially sound place of work for all our employees, where potential work injuries and work related health problems are pursued and averted. At Presona, we work to create added value for our stakeholders without compromising the high standards we set in terms of our environmental and social responsibility. We support and operate our business in accordance with the Ten Principles of the UN Global Compact, the general concepts expressed in the International Labour Organization (ILO) conventions and the OECD Guidelines for Multinational Enterprises.Our Code of Conduct is applicable to all employees, offices and Board members of Presona, in all markets and at all times. Presona encourages suppliers, sales agents, consultants and other business partners to adopt the Global Compact principles as well as those in our Code of Conduct. Every employee has received a copy of the Code of Conduct and needs to understand and comply with it. The Code of Conduct should be used as a support tool laying down the principles on which our day-to-day work is based. If an employee has reason to suspect that laws, other legal requirements or the Code of Conduct, are possibly being violated, he or she has the right, without fear of reprisal from anyone, to inform the management of any suspected criminal or seriously improper activity. We respect the rights of the individual, act in accordance with fair business, marketing and advertising practices and are committed to continuously developing the safety and quality of our products and processes. We respect the rule of law, conduct our business with integrity and honesty and are accountable for our actions. We continuously work to reduce the negative impact of our operations on the environment and health. We do not engage in illegal operations or operate in the context of illegal activities. We do not tolerate the offering, solicitation or acceptance of bribes. We are all entitled to alert the designated compliance offices if we witness any violations of laws or of this Code of Conduct. Presona listens to its stakeholders and takes their opinions into account with the objective of ensuring the sustainable success of our Company. Our fundamental principles shall contribute to ecologically sustainable development and to safeguarding the health and safety of all our employees. Presona has implemented and maintains a certified environmental management system in accordance with ISO 14001. We shall train and inform our employees about environmental, health and safety issues and involve them in a continuous improvement process. We will work to increase our resource effciency by reducing the consumption of energy and raw materials in our production and to improve the recovery resource efficiency of our products. We shall pursue a health and safety work in order to minimize, and if possible eliminate, the risks at our work places. We shall, wherever we operate and work, maintain good health and safety standards and work to minimize, and if possible eliminate, the effects of accidents. We do not permit employees to be intoxicated at the workplace or to work under the influence of drugs. Environmental, health and safety aspects shall be taken into account in the development of products and processes. Our fundamental principle is that we respect our employees and their human rights. We will not apply special treatment to employees in regard to employment or work assignments on the basis of gender, race, religion, age, disability, sexual orientation, nationality, political opinions, or social or ethnic origin. Presona employees shall not harass or discriminate against any colleague or business partner for any reason. We will respect our employees’ right to be represented by unions and other employee representatives, as well as their right to take part in collective employment agreements. Wages and salaries will be paid as agreed and on time. We do not allow illegal or forced labour or child labour in our own operations or in the operations of our suppliers or any other parties with whom we cooperate. Our fundamental principle is that we will provide appropriate training to improve skill levels. All employees are responsible for their personal development of skills and capabilities. In accordance with business needs, we will provide the opportunity to improve our employees’ capabilities in order to develop their professional skills and enhance their social and economic opportunities. Competence development activities shall aim at creating the right conditions to fulfill present and future requirements. Our fundamental principle is that Presona employees shall not participate in any activities that are in conflict with the interests of the company. A conflict arises when an employee’s personal, social, financial or political activities have the potential to interfere with his or her loyalty or objectivity towards the company. Employees shall avoid all situations in which there is a potential conflict of interest. Employees shall avoid personal or family financial interests in, or indebtedness to, enterprises that have significant business relations with Presona. At the management level, Presona does not accept outside employment without specific approval from the CEO. All potential conflicts of interest shall immediately be reported to management. Our fundamental principle is that in all our business activities and relations with customers, business partners and authorities, sound business ethics must always prevail. We do not accept the offering, solicitation or acceptance of any form of bribes, whatever the form, method or purpose. The remuneration of agents shall be appropriate and for legitimate services only. No employee shall seek or accept any gift, entertainment or personal favour that might reasonably be believed to have an influence on business transactions or which is contrary to applicable laws or customary business practice. Gifts, entertainment, compensation or personal favours may be offered to a third party only if they are modest in value and consistent with applicable laws and customary business practice. Our fundamental principle is that all entities and employees of Presona must at all times observe and be in compliance with applicable laws on competition. If there is any doubt regarding applicable competition law, legal advice must be obtained. Certain types of agreements that are particularly sensitive with regard to competition law must not be negotiated or entered into without the involvement of the management. Presona is committed to working with suppliers who adhere to our quality requirements and business principles. We will strive to support positive changes as regards quality, the environment and the work environment. Our ambition is to include the requirement of compliance with the Presona Code of Conduct in supplier contracts. We will insist that suppliers follow legal requirements and work actively to reduce negative environmental and health impacts from processes, services and products. We will encourage suppliers to implement certifiable quality and environmental management systems. We will support and continuously monitor the performance of our suppliers. If a supplier is found not to be adhering to an agreed specifcation, we will consider appropriate actions, including demands for corrective measures, or termination of the relationship. Our fundamental principle is to take all reasonable steps to ensure the safety and quality of the goods we supply. Our products shall meet agreed and legal standards for customer health and safety, including health warnings, product safety and information labels. We will offer sufficient, accurate and clear information regarding our products’ content, safe use, maintenance, storage and disposal to enable our customers to make informed decisions. We will provide transparent and effective procedures to address customer complaints and contribute to a fair and timely resolution of customer disputes, without undue cost or burden. Our ambition is to assess, and address in our decision-making, the foreseeable environmental, health, and safety-related effects associated with our main products over their full life-cycle. Our fundamental principle is to contribute to a better society by supporting local communities where we operate. We will strive to hire and develop local employees and managers. We shall not make contributions to political parties or committees or to individual politicians. Our fundamental principle is that all communication shall adhere to relevant legislation, regulations and standards. Our communication shall be transparent and honest. We are committed to being open and accurate within the limits of commercial confidentiality. Our communication shall be characterized by close relations with the our stakeholders and based on frequent contacts, clarity and strong ethics. As employees, we are all required to observe the applicable rules on preservation of confidentiality regarding the company’s and the business partners’ proprietary information. On this page, we describe how we process your personal data. In some cases, contact with Presona may result in the transfer of personal data. “Personal Data” means any kind of information that may be directly or indirectly attributed to a natural person. Presona AB is the data controller for the information you provide to us or is collected by us from another source. Below is a description of the policies that Presona applies to personal data processing and more. Additional guidelines may apply in specific cases. The guidelines also do not restrict the rights provided by law or other legally binding provision. Usually you can visit our website, www.presona.se, without personal data, or similar information, being collected. We only collect information that we use for statistics and analysis and the visitor is anonymous. Examples of such information are the time of the visit, how long the visit lasts and which pages are visited. So-called cookies are set during visits to www.presona.se. The visitor may also voluntarily submit his personal information to Presona on the website, via our forms. Presona may also gain access to personal data when, for example, someone gives Presona his personal data by letter, email, telephone or Presona receives data from public records. Presona processes the personal data provided to us. This may include your name, e-mail address, telephone number, postal address and/or other information that you have provided to us or which is otherwise necessary in order for us to fulfil our obligations to you.Why does Presona process data about me? When does Presona have the right to process your personal data? Presona has the right to process the personal data necessary to fulfil our obligations to you or if you have given your consent to processing. Presona may also need to process your personal data as a result of legal or statutory requirements. In some cases, Presona may need your consent before processing your personal data. When you give consent in such cases, you will always be given clear information about what you are consenting to. Your personal data is used by Presona and by Presona’s data processors. We do not pass your personal data to other companies unless we need to do so on the basis of law, ordinance or public authority decision or in order to protect our rights or those of third parties. We never pass on, sell or exchange your personal data for marketing purposes to third parties outside Presona. If your data is incorrect, incomplete or irrelevant, you can request to have it corrected. We cannot delete your data that constitutes an official document or where there is a statutory requirement for it to be stored, such as under accounting regulations, or where there are other legitimate reasons why the data must be stored, such as unpaid debts. You can withdraw your consent to our use of your data for marketing purposes at any time. Presona never stores your personal data longer than necessary. When personal data is no longer required, they are deleted. This applies, for example, to when a question has been answered or when a contractual relationship has been terminated and the parties’ transactions are finalized. However, in certain special cases, the data may need to be saved, too, for example, for statistics or accounting purposes.